IIS administrators who read English, Português, Spanish or Chinese. This utility backs up all IIS settings to an XML file, and lets you restore sites and features selectively. You can backup sites from IIS 5 and restore to IIS 6, for example, when upgrading from Win2000 to Win2003. You can restore sites individually -- by web site name. See also: Operation chapter of reference manual. download iisbr02.zip and then obtain a free 30-day unlock code for IIS Backup. IIS Backup includes a professional reference manual in PDF format. You are welcome to download it separately if you like. FREE upgrades for at least one year for all registered users. The upgrade from v1.x to v2.0 is FREE. Free support is available via our newsgroups. 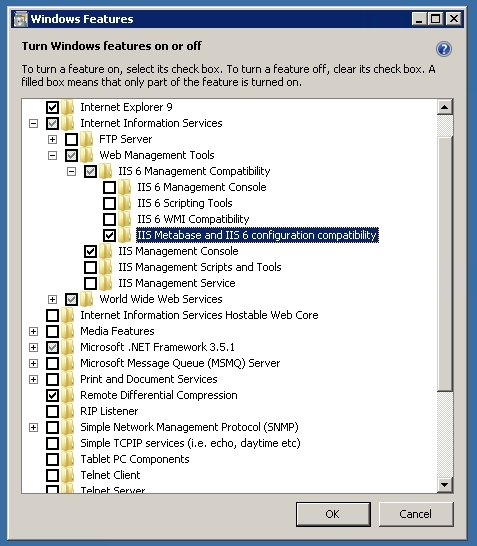 ☑ When using IIS 7 or 8, the IIS Metabase and IIS 6 configuration compatibility are required. See screenshot. Toggle those on using Control Panel > Programs, Windows components. ☑ IIS Backup must be run under an account with Administrator rights. Electronic download, unless you order through RegNow. RegNow can provide CD media for IIS Backup.